So you might remember my recent adventures with hexagons. I loved making the individual hexagons, but after making a bunch of them, I realized that I really disliked sewing them together by hand. I ended up giving most of them away, though I held on to this bunch, since they’re a match to a quilt I’m working on. Spending last weekend sick on the couch must have helped, because I got four rows of hexagons sewn together (and no, I still don’t enjoy the process!). I pieced that hexagon strip in with some Kona Snow and came up with this pillow. I quilted it with just a few simple lines running horizontally across the pillow and finished it with a little striped binding. I wanted a second coordinating pillow, but knew that I couldn’t tolerate any more handsewing, so instead I went with something else I never do… applique. This one is inspired by a comment someone left during my hexagon giveaway, suggesting that it would be easier if I just appliqued the hexagons on individually – no handsewing required! I scattered the hexagons across the Kona Snow somewhat haphazardly and then stitched them to the base fabric. I used similar simple quilting lines on this one, but did these on a slight diagonal. I don’t think I’ll be making any more, but I really, really love these! And now I better get working on that matching quilt! 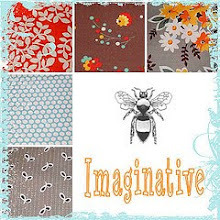 This entry was posted in Household Goods and tagged applique, english paper piecing, flea market fancy, handmade, hexagons, hope valley, kona solids, pillow covers, Pillows. Bookmark the permalink. Love these! They are fabulous. The striped binding is killing me (in a good way). I love how the floating hexagons turned out. I would never have thought to do that, but I can see how it would save sanity… and it looks really stunning. These are just great! I love them both! I love your floating hexagons! What a really brilliant idea, and what a unique and wonderful pillow it made! Thanks for sharing your photos! Fabulous! I like the mix of old and new. I love Hexs! Your fabric combo is yummy especially with the striped binding. When you first started your adventure with hexagons, I thought I might try them too. But when I read that you hated the hand sewing part, I shook my head in agreement and knew hexes were not for me. 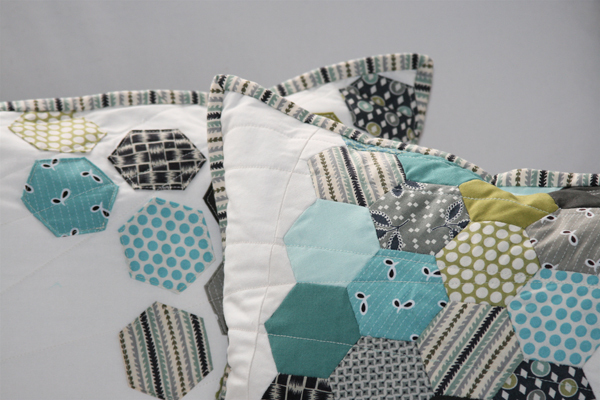 Seeing these pillows – particularly the scattered hexes – has once again inspired me to try hexagons on a small scale. The pillows are stunning! haha, a couple days ago i finally gave in to the temptation of trying hexes (yes, YOU’re to blame!) and i’ve since gone hex nutty. and now i’m about to complete two pillows very similar to yours. just that my hexes are smaller (i said nutty) and my colors brighter. these are gorgeous and all the more reason for me to continue despite the aching fingers. Love love love! You have outdone yourself again! I really need to get back to mine…they’re calling out to me now! The pillows are very beautiful! 🙂 I love them. Love these pillows! Great job! What a great use of your Hexagons. I love how you put them together. I love these pillows. The color, the quilting, and especially the use of the hexagons. Beautiful! Thanks for the inspiration. Gorgeous! A great use for some of your hexs. I was wondering what it would be like to top stich them together – sort of zig zag them together. I doubt I’m patient enough to do so! Great pillows – can’t wait to see them together with the quilt. Love the cushions and the colors. Good job. At least you can honestly say you tried! Love it! I love the colors! Great idea about the applique. Beautiful! I really like the floating hexagons and the binding is awesome! I know …the binding just makes it! How did you put on the binding/edge and is there a zipper hiding in there somewhere? I love them. SO PRETTY! Love love love it! Stunning. love those pillows! especially the scattered appliques hexs one – gorgeous. The stripped binding is making me swoon! Love that fabric – gotta get me some! Really cute. 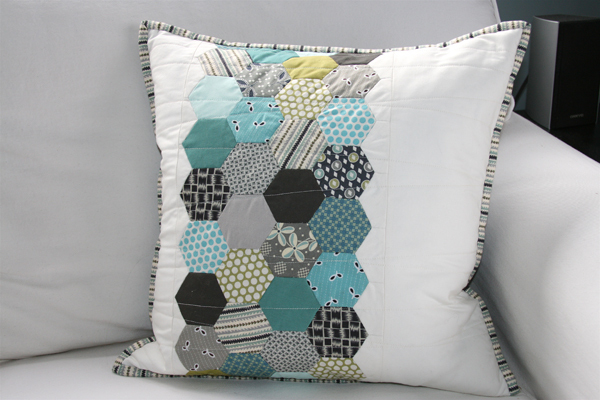 A great way to do something with hexes….without committing to a whole quilt! Ashley…they are gorgeous!! You may not enjoy hand sewing, but you are definatly good at it! You can’t even see the stitches in-between the hexagons, what stitch did you use? I love the color palette too, masculine and beautiful at the same time. I much prefer the appliqued version. That’s my speed. Yup, I love them. Can’t decide which I like the best: hexagons all in a row or scattered. Oooo, pretty. I LOVE the colors you used! GORGEOUS! They are truly koool very, very nice , and really good choice for your hexies indeed!!! I love it. The design and the color choice too. Yay, so happy to see you didn’t give away ALL your hexies! These pillows look like great projects for your hand sewing endeavors – small! I love the scattered look, and that striped fabric frames them so nicely. Very Pottery Barn-ish! Very cute pillows . . . but, more importantly . . . hope you are feeling better! You are an amazing Artist!! I’m just blown away to see what you come up with. Your pillows turned out lovely! I actually prefer the appliqued pillows! Gorgeous combination of fabrics on the snow! Oh, I just love your pillows – I’d love to see them in yellows, honey yellows! Thanks for sharing! WOW!! these are really pretty! I love the colors. Nice Job! Gorgeous! I love these pillows, so beautiful. I’m getting ready to make pillows myself, and now I have new inspiration! I adore them! Some of mine are becoming a pillow too. I literally laughed out loud when I saw this, because it’s too crazy — I JUST got my first order from paperpieces and the same colorway from Hope Valley…in order to make pillows, with hexagons. Too funny, you were already doing the very same thing! 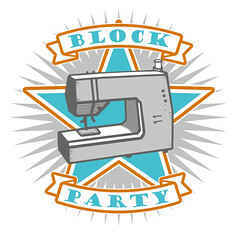 I must have quilting ESP! The pillows turned out very pretty – congratulations on some great designs! Really love your pillows. The colours are great. Love these pillows!! I want to make my own right away. Did you sew the binding the same way you would on a quilt? Love them! I knew you would find something to do with some of the hexagons. Great work! Ashley…..I have a stash of hexies that were on their way to becoming a quilt. I gave up after a while and use the fabrics to make a pieced quilt. Now, thank to you, I will make pillows to go with the quilt and really dress up my guest room! I have the same exact problem as you. I love the individual hex basting process, but hate the rest of it. I need to do something like this with the hexagons I have. There is no way they will become a quilt! Your pillows are both super cute! 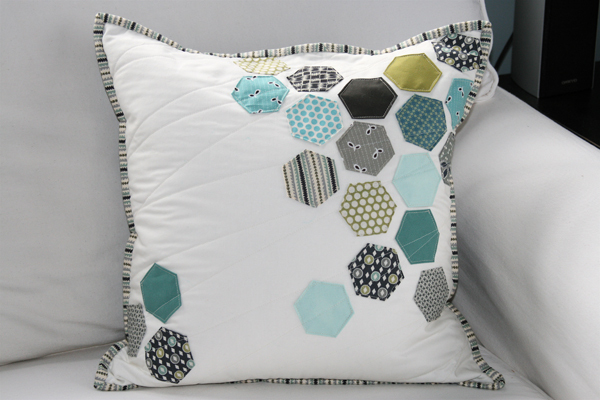 What a nice idea- I may have to try some hexagon pillows myself. I scoped out this vid for machine piecing whole hexes when I was thinking about doing a hex quilt. I don’t know if it would work in real life, but it would be worth a try. Love your pillows!! What size hexes did you use?